CRYPTO Uncertainty Leading To Bear FavoritismsteemCreated with Sketch. I feel like the longer we continue to see this type of action without much of anything, the more the bears are taking over and will end up taking control of price movements again. We're currently looking at some slight pullback action -- Ethereum had a pretty bearish looking break, actually. Hourly charts are actually looking to favorite bear pressure. Overall, the sentiment seems to have fizzled about a bullish optimistic approach. 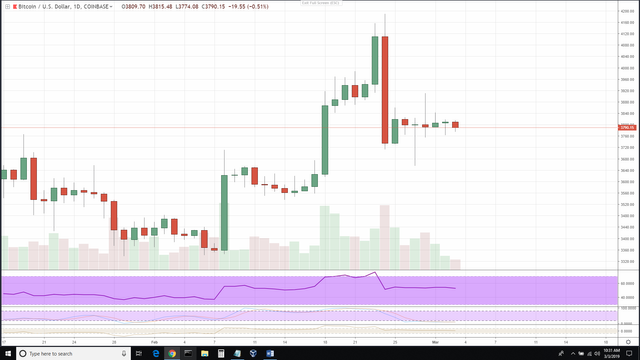 Traditionally, April has been a good month for cryptos, so potentially we're looking at another rally then for an oversold bounce if we dump? Who knows, but market scales are definitely beginning to top back towards the favoritism of the bears. Did you hear about Kroger abandoning Visa and possibly integrating the lighting network into their retail stores? This could be huge for the crypto market because Kroger is one of the biggest supermarket chains in the U.S. With that and the institutional investment that's going to be starting this year, it's only a matter of time before the bulls take back the market. That's not even mentioning all the maturing altcoin infrastructures like BAT and Steem. interesting, thanks for telling me! didn't hear about that. yea, it seems it's always something that starts being the catalyst. Like we've seen gold start to grow -- typically a sign of economic hardship.